ALLPLAN, a leading vendor of BIM solutions for Civil Engineering and Infrastructure projects, is pleased to be supporting this year’s Marine & Coastal Civil Engineering – the only event dedicated to innovating marine and coastal civil engineering from the 12-13th September in Birmingham, UK. 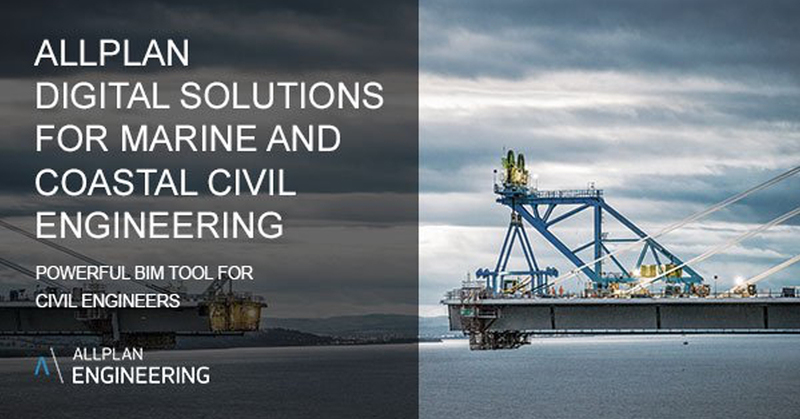 The Marine and Coastal Civil Engineering Expo provides marine and coastal engineers with the latest platforms in the UK to discover and shape the sector. Leading coastal engineering companies come under one roof offering unique opportunity to find, learn and purchase the latest infrastructural and civil engineering solutions available to transform their projects. ALLPLAN has supported the infrastructure and civil engineering industry for over 30 years and continues to play a key role in promoting digital solutions. Come stop by our stand (4B121) where ALLPLAN will be demonstrating the latest Allplan BIM solutions for Infrastructure and Civil Engineering and show how ALLPLAN supports the entire BIM process with superior and productive workflows. Fast production of error free drawings and deliverables. We’re speaking at this event! Come and listen to our experts as we discuss ‘Advanced Digital Modelling Capabilities for Marine and Coastal Engineering’. Download your FREE trial of Allplan.